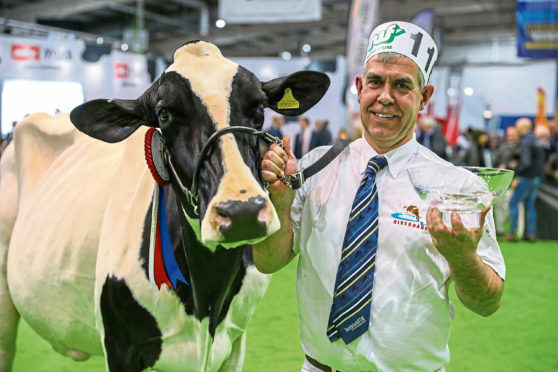 Recognised as one of the best shows of elite dairy cattle in the UK with £25,000 in prize money up for grabs, AgriScot boasted an increased entry of 117 cows this year. For the first time, an exhibitor took both the Super Heifer and Super Cow championships with the same breed. The Super Cow title went to the fourth calver, Sahara Sanchez Ambrosia by Gen-mark Stmatic Sanchez. She last calved nine months ago and is still yielding 55kg per day. She was champion at Nantwich Show this summer. Reserve was a Jersey shown by Lindsay Fleming, Downpatrick, County Down. This fourth calver, Bluegrass Vindications Harp by Vindication CJCC, is no stranger to the show ring, having won Dairy Expo three times, Dairy Day once and the Highland Show twice. She belongs to a trio of Irishmen – Mr Fleming, John Henning and Keith Agnew and kept at Michael Yates’s Castle Douglas farm. The Super Heifer was the January-calved Riverdane Brady Sharon by Butx-Butler Atwood Brady. Described by judge Kevin Wilson, Thursby, Carlisle, as “a heifer with a great future ahead of her” she was interbreed champion at Cheshire County Show. Reserve was Mungo Bryson, Whiteflat, Catrine, Ayrshire, with his Red and White heifer, Whiteflat AA Anita Red by Apples Absolute Red, she was champion at Tarbolton Show and West of Scotland Red and White champion. The Lawrie family at Cuthill Towers, Milnathort, had the best Ayrshire heifer in the August-calved, Cuthill Towers, Mad Rae by Cuthill Towers Madison. This one from their herd of 240 milkers was being shown for the first time.